I collected my group at King's Lynn Railway Station just after midday for our 4-day mini-birding break in North Norfolk. It was raining fairly heavily as I drove to King's Lynn but by some miracle it had stopped just as their train pulled in. It wasn't long however before the rain started again as we drove from King's Lynn to Hunstanton to our hotel. We noted several Common Pheasants, Red-legged Partridges, a Jay and lots of other corvids along the route. At the hotel we checked into our rooms and had a quick cuppa whilst we changed into our waterproof clothing, it 1:45 when we left for our visit to Titchwell. 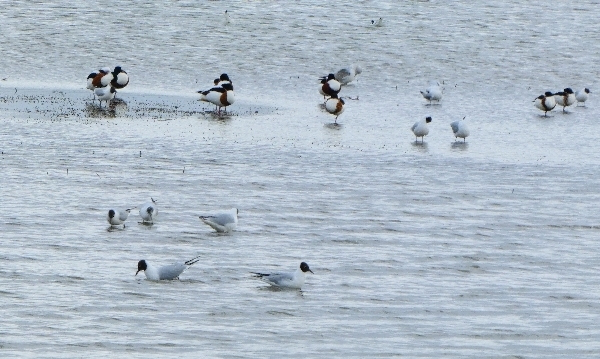 This was a change of plan because of the weather, our first choice was Snettisham but it would have been too exposed to the elements there and the shelter of the large hides at Titchwell were much more appealing. Despite the rain we had a great visit to this wonderful reserve, from the car park all the way down to the beach birds appeared in good numbers. Around the visitor's centre and the bird feeders we noted many common species and a few Siskins fed in the Alder trees. In the ditch by the side of the main track we watched a very obliging Water Rail and then the we scanned the first of the many pools in the vast reedbeds. The rain persisted throughout but luckily there was very little wind although it was quite cold. In the first pools we saw Eurasian Teal, Common Pochard, Northern Shoveler, a few Wigeon and a distant Tufted Duck. Greylag Gesse were everywhere and the noise from the Black-headed Gull Colony drowned out most of the other calls. A little further on we saw three Red-crested Pochards which was an unusual sighting and a great bird for our list. Over the next hour we visited both of the main hides but spent most of our time in the large Parrinder Hide. 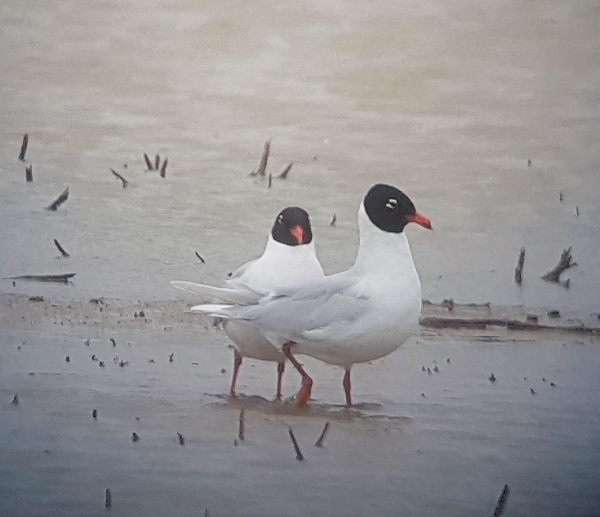 From there we listed a few waders and to our great delight we had much better views of four adult Mediterranean Gulls which we had scoped from the main track. 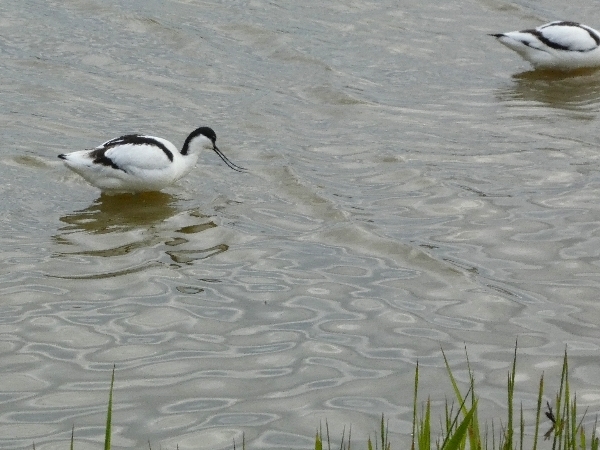 Pied Avocets were everywhere which was good to see, we also saw Common Redshank, a small party of Red Knot, a couple of Ruff, and a Grey Plover. We then walked to the beach, it was bitter cold there but the rain had eased off by the time we reached it. We got very little for our efforts, a single Sanderling, a couple of Ruddy Turnstones, a single Common Ringed Plover, lots of Oystercatchers and not much else. Out on the sea we saw just two Goleneye, a couple of Common Scoter in flight and a distant Red-breasted Mergganser. On our return to the main track we decided to pay the Parrinder Hide a second visit because we were told that a WATER PIPIT had been seen. We never found the pipit but we enjoyed views of a few other wading birds and a couple of large flocks of Brent Geese flew over us as we approached the hide. We spent another 30 minutes looking for the pipit and discovered instead Common Snipe, Little Ringed Plover, Eurasian Curlew, Black-tailed Godwit (one of which was looking splendid in its summer attire) and a single Sandwich Tern. The rain stopped, the wind eased off and we enjoyed the best of the days weather as we walked backed. Marsh Hariiers had been ever present throughout our stay and by scoping the distant hills we also found both Red Kite and Common Buzzard to join our raptor list. Several Barn Swallows had been flying over the pools and they were joined by Sand Martins and a single House Martin. a single sighting of Bearded Reedling was made by just me and we all heard a Common Chiffchaff calling. We spent a little time scanning the fields to the west of the reserve and discovered Red-legged Partridge, a Muntjac Deer, some Brown Hares and a Rabbit. Back at the visitors centre we watched many common birds and saw the Sisikins again before we jumped back onto the bus, in those few hours in the rain we had recorded 71 species, an amazing tally considering the weather condition and a testament to how good Titchwell can be. Let's hope the weather improves tomorrow!